We are a leading Wholesale Trader of digital table model conductivity and tds meter from Mumbai, India. 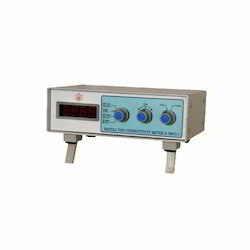 We are one of the well-known suppliers of a superior quality range of Conductivity and TDS Meter Digital Table Model. These are manufactured using superior quality basic material and are capable of giving accurate testing results for varied types of liquids and fluids. Offered at market leading prices, these are extensively demanded in market. Looking for Conductivity and Tds Meter Digital Table Model ?